For the past few weeks, residents of the Mineral Point Care Center have been filling thousands of eggs to get ready for the annual Kiwanis and Key Club Easter Egg Hunt scheduled for tomorrow morning at 10:00 a.m. Volunteers from the MP High School Key Club and MP Kiwanis Club arrive early to spread out the eggs on the vast lawn that stretches all the way back to the Gundry House. 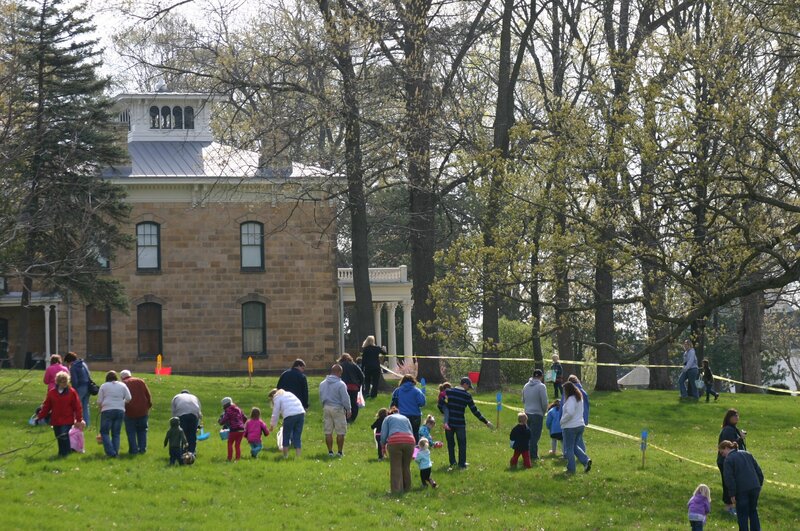 The Historical Society always welcomes this incursion even though the lawn mower (Mayor Bennett) and the volunteer groundskeepers probably encounter un-found plastic eggs for months afterward. Everyone is welcome – tomorrow morning, Saturday April 4, 2015 at 10:00 am at the Mineral Point Care Center. This entry was posted in Family, Upcoming Events and tagged Easter Egg Hunt, Kiwanis, Mineral Point Care Center. Bookmark the permalink.